Okay, this is my first tutorial so go easy on me. If something doesn't seem to make sense I will try to explain it better. I tried not to get too wordy with it and used pictures where it seemed useful. Of course, the usual restrictions apply, don't pass this off as your own pattern, link to this tutorial and give credit if you do make this. Do not make this for profit, though if you get in contact with me and explain the situation an exception might be made. Please make this for charity and gifts, send me a pic if you do - I would love to see them! I like a bag that is sturdy and looks just as nice when it is empty as when it is full. But this pattern does still look nice even if the lining isn't interfaced, or if it is interfaced with a mediumweight interfacing instead of heavy. Guess I'm just trying to say it is a flexible pattern. Fold the fabric selvage to selvage to cut it. If you are a visual person I snapped these pictures to show all the dimensions. * that red text I tried to highlight came out unreadable, it says 5 1/2 inches. There will be a few pieces left over. Make them into small pockets if you're feeling ambitious. Now that all the pieces are cut out cut your interfacing for each piece. I cut all of my pieces 1/2 inch smaller on each side to minimize on bulky seams. A couple of exceptions are the Lining Sides. Cut a 4x10 inch piece of interfacing for each and then cut each one in half so you have 2 2x10 inch strips. Fuse each strip with the same half inch seam allowance so that there will be a 1/2 inch gap left unlined. This is where the Zippered Divider Pocket will be sewn in later. I also did not interface the Divider Pocket pieces, or the Lining for the side pockets, and only interfaced half of the handles. For the Top Trim cut 4 18x4 inch rectangles of interfacing and we'll shape those next. To shape these pieces draw the pattern onto one Top Trim Interfacing piece that has been folded in half. Measure in 3 7/8 inches from the folded edge and 1 1/2 inches down. Draw a curve to remove the sharp angle and cut out this piece. Use the discarded piece as a template to draw the rest of the curves. Now measure over 1 3/4 inches from the top of the curve (this is where the handle will be attached) and use your template to trace the curve again. 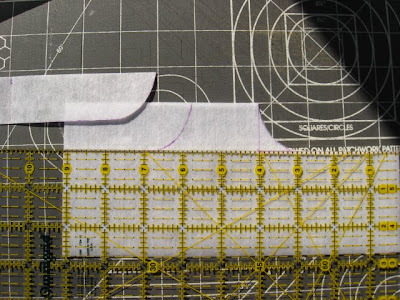 Cut out the curve and then trace the pattern onto the other 3 pieces of interfacing. Now fuse all the interfacing to your fabric pieces and cut the Top Trim fabric with a 1/2 inch seam allowance. Now it's time to sew! Pin two handle pieces (one interfaced and one plain) right sides together. Sew along the long edges leaving the ends open with a 1/2 inch seam allowance. Repeat for the other handle. Turn the handles right side out, press and top stitch. Pin two of the Top Trim pieces with right sides together. Place each end of one handle strip into the spaces for them letting them stick out about 1/2 inch or so beyond the end on the Top Trim piece. Make sure the handle is not twisted. Sew along the top edge of the pattern pieces and clip the curves. Turn right side out and repeat for remaining pieces. Open the Top Trim pieces and lay them right sides together. Pin the short sides together on each end and sew. Now turn right side out. Topstitch all the way around the upper edge of the Top Trim, pull the stray threads to the inside and knot. Trim and set aside. Pin one exterior pocket and a lining pocket right sides together. Sew across the top edge then flip so the wrong sides are together, press. Topstitch along the top edge you just sewed. Repeat for the other pocket. 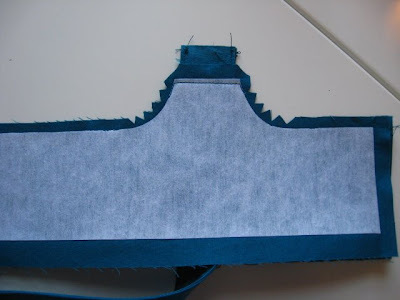 Layer the pieces as shown in the image and sew along the turquoise line. With the other pieces layer them the same as the picture except sew the Pocket and Side pieces to the other edge of the fabric so you will end up with a pocket on each end of your bag. Open up both sets and lay them with right sides together. 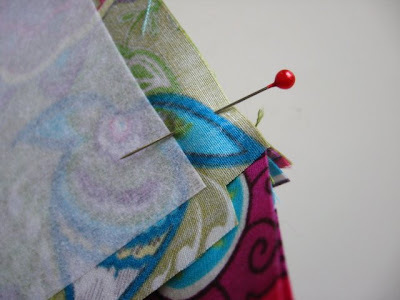 Pin and sew each end to create a tube. 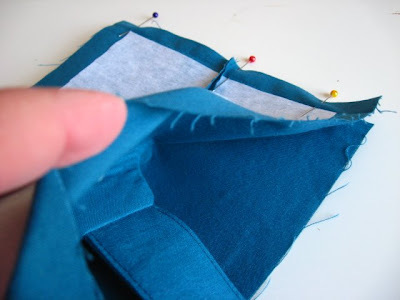 Cut a small square out of each corner of the bottom piece to make sewing in this piece easier. Line up the fabric so the corner of the interfacing points into the side seam. Repeat for each corner. Pin along the long sides of the bag. 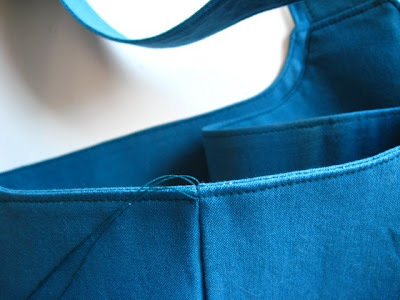 Sew up these sides beginning and ending at the corners of the interfacing to preserve the shape of the bag. Line up and pin the short sides together on each end and sew them the same way. You're done with the exterior part of the bag! Now I think I should divide this tutorial in two posts because it is getting pretty long. I would just like to say... this is book quality tutorial goodness. The photos are great... the info is great... it's just great, great, great! This tutorial is absolutely GORGEOUS! Thank you! 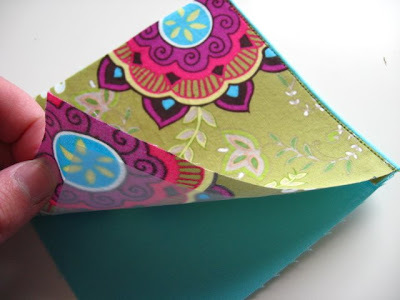 Great tutorial -- fantastic material for that tote! Looking forward to trying this. this is a wonderful tutorial! I'll be making this soon. I am fed up with 3 of the 4 standard pattern companies. I've kicked myself many times,cried and almost quit sewing for all the angst over gastly instructions. 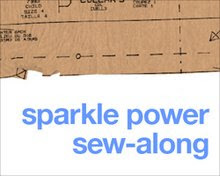 You should consider your own pattern making! great work. PS. the red cape sounds fabulous. I made an emerald green one years ago...I miss wearing it out to special events. Maybe you could be Little Red for Halloween???? you could put a warrior space age twist to the theme. WOW What a great tutorial, I've been wondering how to do a bag with one of those pockets and I've been looking for something cool to make with my latest consignement of cherry material. Thank you! And thanks for stopping by on my blog and for your sympathy message. Hope you enjoy the mayo! I am new to bloging etc. too,and came to your site by an accident.But I liked the way you have presented your tutorial,especially,the curves on the bag.thanks. BTW, belated,but still heartfelt Birthday Greetings. This is an awesome tutorial! You put a lot of effort into it! I can't wait to make one! This is an EXCELLENT tutorial. The pictures are so strong and basic. I like the way you showed the pieces on the cutting mat, with the sizes so clearly labeled. I'm going to try to make it this weekend! I LOVE this tutorial, great job! I was wondering what the finished size of the bag is? I'm trying to find a tutorial/bag that is at least 14" tall x 18" wide x 4" deep. I'm sure I could alter the measurements to match that, but wanted to get an idea of how much to alter...Thanks!! I just found this tutorial through a Google search and I can't wait to try making a bag from it. Thanks for taking the time to make such a great tutorial! OK, I'm hooked. I've been sewing got, uh...50 yrs. I was looking for 'see how maybe can find suggestions before I got started'. I want a bag that will hold up, can be used for travel and shopping with lots of pockets. Had NO idea I would find yours. Love your site, suggestions and instructions are GREAT!! I plan on coming back here often. 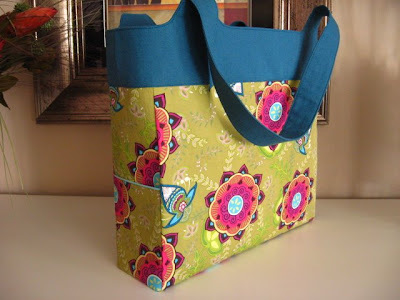 i'd like to try this out.. thanks for the tutorial..
Great tutorial and cute tote! Thanks! i googled "adding a divider to a tote bag" and found you! 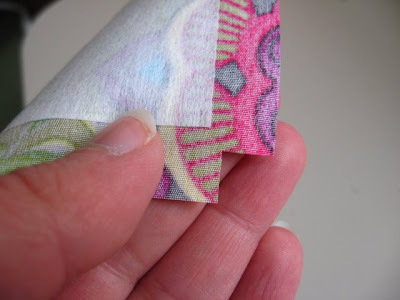 i also posted a link on Quilters Haven to your tutorial. Keep up the great work! Thanks for this tutorial. It was great! I ended up making two of these bags for my daughter's teachers as end-of-the-year gifts. Great, great job! 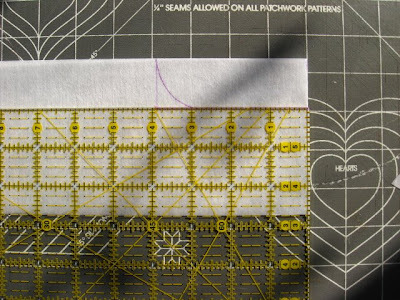 Your excellent tutorial will be featured at PatternPile.com! Would this "translate" if I enlarged the bag base and sides to more of a square for a larger tote? hi i just saw your tutorial and i have some concerns ... this tote when you put it on the floor or table does the tote fells down you know what i mean? like i does stay firm or is to soft? it depends on the fabric or what? im looking for one that stays firm... thank-you for your time and talent !! Angeles Mejia this tote was designed to stand up by using interfacing to keep it's shape. The sample in these pictures was made with quilting cotton and a medium interfacing. What are the dimentions of this bag, and if I want it shorter is that hard to do?